If not me, then who? Who will stand up for the little guy? For the bullied, small, and swarthy. For those who make people recoil with fear and ignorance. If not me, then no one. So give me your huddled masses yearning to be free. I’ll eat them for breakfast! Here’s to the anchovy! For he’s a jolly good fellow! Equal rights for the anchovy! Down with the bland, up with the anchovy! I love anchovies! Viva l’acciuga! Now this isn’t easy to say, let alone support, in a country that has taken Italy’s favorite pizza topping and replaced it with Canadian bacon and pineapple. I am Sisyphus, I know, but what to do? I could try something dramatic, like a march on Washington, or a hunger strike, or call Bill Maher. But no, to me these solutions seem ineffective, unpleasant and/or whiney. All I can do, my friends, is try to educate and open eyes — one Sunday Pasta at a time, one tongue at a time. So here goes. There are 144 species of anchovies in the world, but most people first think of the Mediterranean variety, which are among the smallest, only an inch or two long. Rich in Omega 3 and 6 fatty acids, they are good for your brain, even when cured in salt, preserved in olive oil, and then packaged in a little tin. Anchovies are ubiquitous in Italy. 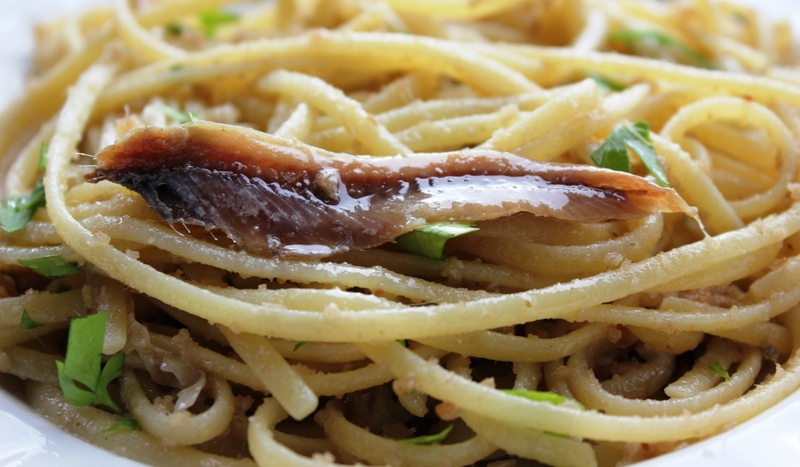 In small quantities, anchovies add a nuanced salty flavor to almost any dish. In large quantities, hear them roar. For the bread crumbs: Cut your favorite bread into 1 inch slices (remove the crust) and bake at 300 degrees for 5 minutes each side or until lightly toasted. Mash by hand or blend in a food processor until crumbs. Set aside 4-6 anchovies for garnish. Chop the remaining anchovies into pieces and sauté together with the garlic and olive oil in a large skillet over medium heat until the anchovies disintegrate into a paste. Simultaneously, cook the pasta until just shy of al dente and drain it. Add the pasta to the anchovy mixture and then mix in the bread crumbs and the parsley. Serve immediately with an anchovy garnish and a sprinkle of black pepper. (Feel free to add more anchovies above for a stronger taste. If the resulting pasta seems dry, drizzle with olive oil). Check out our wine pairings for Linguine alle Acciughe and our About post that gives a brief history of the dish. i make it similar except to your recipe I add about 1 tablespoon of red pepper flakes, 1 cup of white wine, 1 cup of sliced cremini mushrooms and 1 tablespoon of capers along with 1 head of broccoli florets.Mmmmm. Even those who “think” they don’t like anchovies should give it a shot…..they’ll be surprised how they will quickly change their minds! 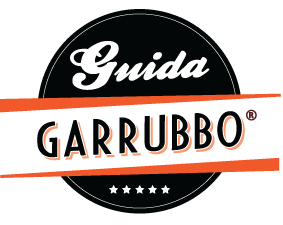 This recipe brings back sweet memories of celebrating The Feasts of San Giuseppe for my Dad. Sometimes my Mom would make a tomato sauce and just add the tin(s) of anchovies depending on the amount of sauce in the sauce where the anchovies would just melt! My mom usually made this recipe using the thickest spaghetti. We would also have this recipe on Ash Wednesday. I just recently learned that the toasted bread crumbs symbolize the “sawdust” for St. Joseph’s work as a carpenter. Some of my friends react in horror if I even mention the ingredient “anchovy!” Thanks for sticking up for “the little guy!” Will enjoy making this recipe again in memory of my Dad, Joseph! I love anchovies. I buy tgecanchovies brand Recchia in a tin using these whole anchovies packed in salt, wash them off and filet them. I find they have the best flavor. Sometimes i mix them with my capers from Pantilleria.